My friend and neighbour is in hospital, though we hope she'll be home tomorrow. I didn't need to visit her as she had family there, and I was glad of it, because she's in the ward where Harvey died. Some days the past crowds in. I spent the morning going through his computer files to make sure we had saved them all before they're deleted from the machine. Such a wealth of writing. I also set about disposing of the dresser - thanks to my new cupboard, I don't need it any longer - and was silently apologising to Harvey as I made the phone call. He would never have agreed to it going. 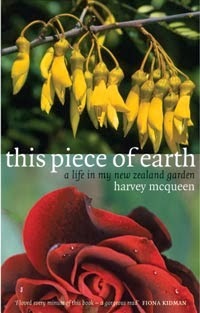 But he would have loved my Taranaki garden trip, though he would have been deeply envious of their volcanic soil (we had the same kind in Mt Eden where I grew up), where everything grows magnificently. One of the loveliest things I saw was a commercial planting of flag irises, in every imaginable iris-colour combination.. I don't covet the grand gardens, I know how much work they involve, but thank goodness there are people who like to spend their time creating these marvels for near-non-gardeners like me to enjoy. It's very soothing just to wander round gazing at them and not thinking about anything else, past, present or to come.